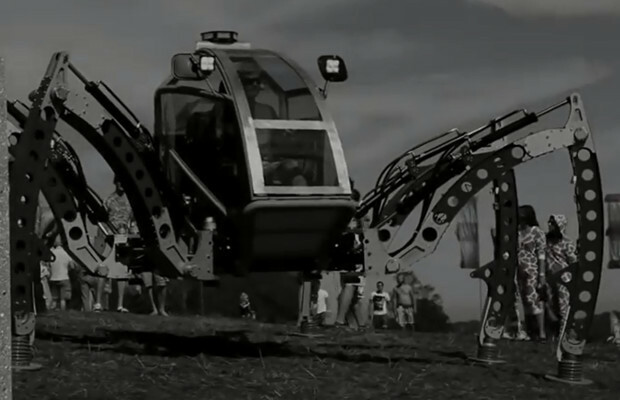 Hexapods, mechanical creatures with six legs, can be one of the easier ways to make a walking robot. A hexapod was one of my first robotics projects, and it turned out great. Great for being around 4 inches tall that is! If you’d like inspiration to build something much bigger, and admittedly more awesome, check out Matt Denton’s rideable hexapod, the Mantis. The video below shows a good demonstration of what this monster can do, but there’s a lot more on Matt’s Youtube page, so be sure to check that out if you’d like to see more of what he’s been up to. The robot weighs in at 1900 kilograms, and is powered by a 2.2 liter turbo-Diesel engine. Standing, it’s 2.8 meters tall, so it is definitely bigger than anything I’ve ever even tried to build. On the other hand, this beast took 3 years to get to its first successful test drive, so something like this takes a huge commitment. Jokes aside, this is a really incredible machine. As you might suspect, this isn’t Matt’s first robot rodeo; Make featured his somewhat smaller “Stunning Spiderbot” in 2007. It may be small, but the way it is able to track someone’s face, and its fluid motion is really worth seeing!